Commissioner Scala was born in Passaic, New Jersey, and raised in Garfield. He graduated Garfield High School and attended Bergen Community College, where he focused his studies on music – Mr. Scala is an accomplished bass guitar player. Following his schooling, Mr. Scala began working for his family’s business, Scala’s Painting, which was started by his grandfather and passed on to his father. He became the owner/operator of Scala’s Painting in 1980. In September of 2000, Commissioner Scala joined the painters union and was employed by Fromkin Brothers Painting, where he worked until 2011. For the past four years, he was a delegate for District Council 711, Local 1007. 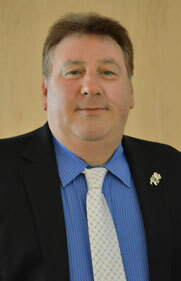 In 2011, Commissioner Scala was elected to a four-year term as Business Agent for Local Union 1007. He has represented District Council 711 as one of the key negotiators for the Council’s current Collective Bargaining Agreement. He also serves as a Trustee for the Bergen County Building Trades and as Vice President of the Bergen County Central Labor Committee. In 2013, Mr. Scala became Chairman for the District Council 711 Scholarship Committee. Also in 2013, Commissioner Scala graduated from the Michigan State University IUPAT Leadership Training Series. In 2015, Mr. Scala was re-elected for another four -year term as Business Agent of Local Union 1007. Mr. Scala has a positive, “can do” attitude and is always ready, willing, and able to assist his superiors, co-workers, and, most importantly, to be there for the Union members. With the vast knowledge he has acquired in this industry over the years, he is well equipped to handle any situation and better serve the Council and the men and women who work for this great Union. Commissioner Scala is a lifelong resident of Bergen County and resides in Saddle Brook with his wife, Sharon Perno. They have two grown children, Jacklyn and Andrew. Together they have built a good life for themselves and their family, and have instilled in their children the importance of strong family values and maintaining an upstanding character as they travel through life. Please note, this is an automated system that reports our current operating status and should only be used in the event of an emergency.